In the summer months, I enjoy working with low fire clay. 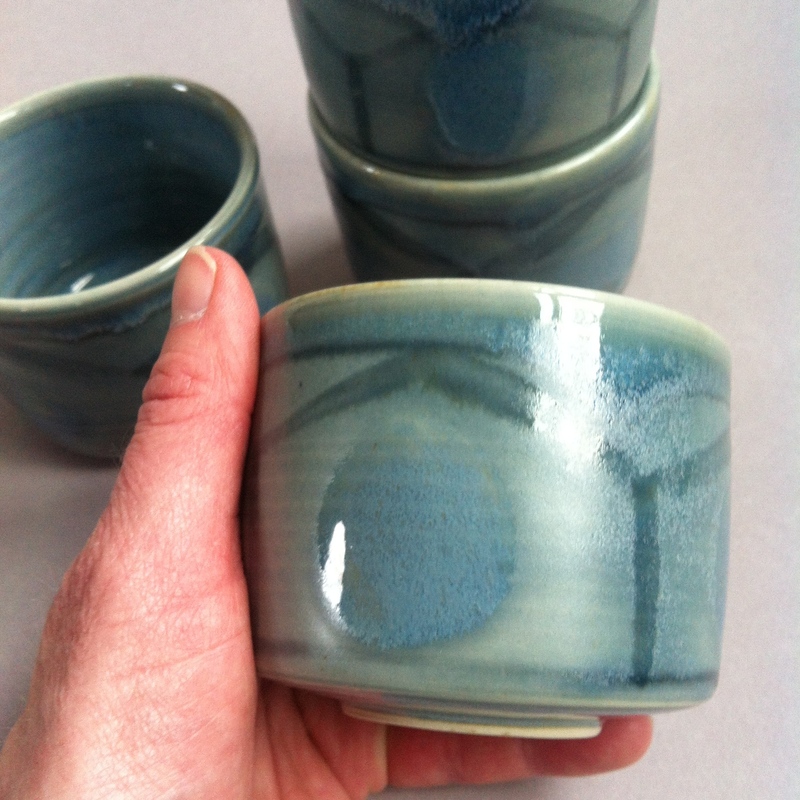 A lower firing temperature allows me to utilize brighter colors that can “burn out” when the temperature in a ceramics kiln is higher. I began creating my “Flowers” collection while working on my summer art classes curricula. I spent time at my local library, pouring over books to come up with new and exciting ideas for my students and found myself interested in learning more about certain flowers. 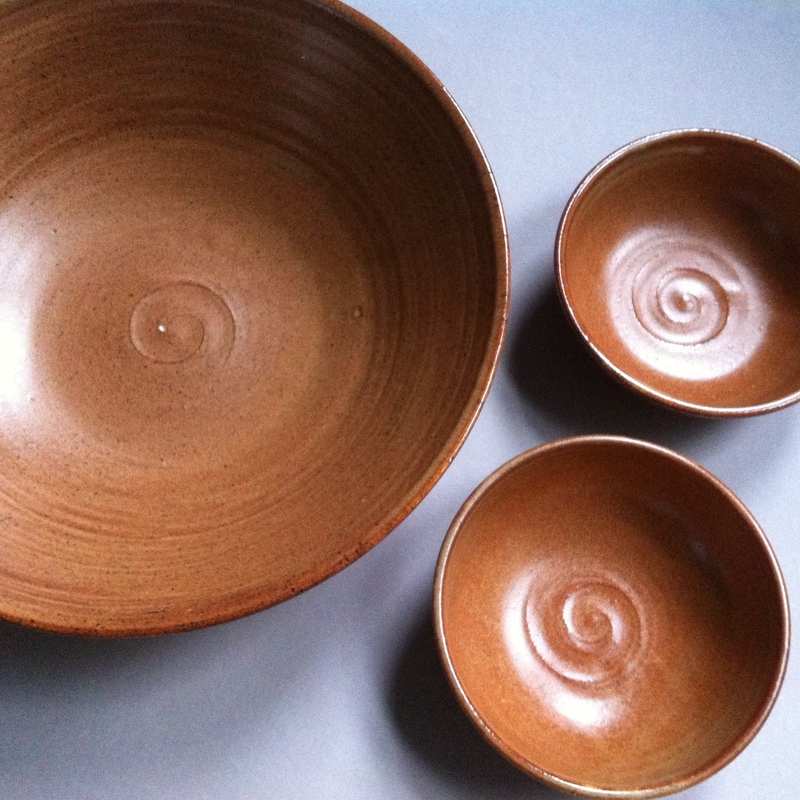 Vessels were hand built and ready for surface decoration. 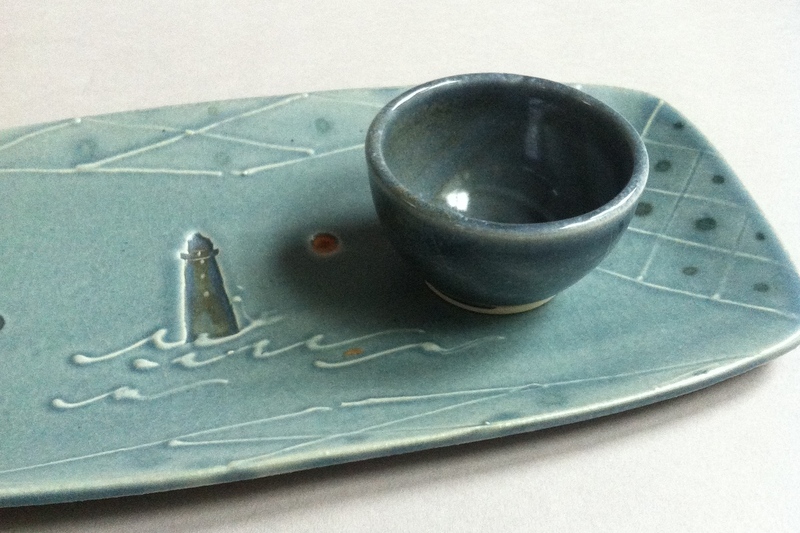 Slips, textures, carving and underglaze ceramic paints were used to create imagery; low fire glazes completed the vision. “Flowers” can be functional for bouquets in water, food for a party; or, individual pieces can be hung on a wall or displayed on a tabletop. 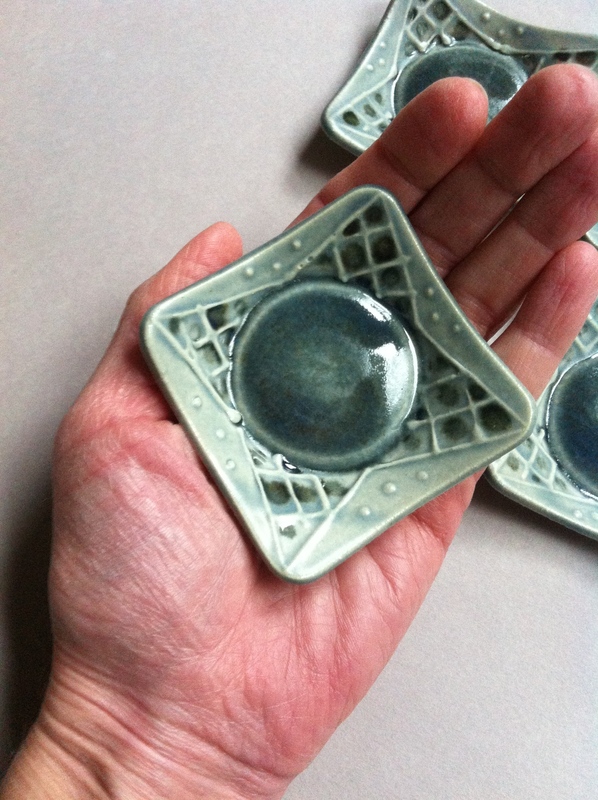 My ceramics are meant to be picked up and explored. Textured surfaces to the finger tip are a delight. Three dimensional art begs to be touched, picked up and interacted with. Ceramics is functional art. Please visit the Dedham Square Artist Guild to purchase a piece from “Flowers”. Each piece is one of a kind. The collection is small but varied. Each piece stands alone but works well together. “Flowers” is perfect for the collector and just right for a wedding gift. The apple blossoms this spring were everywhere… perhaps it was the wacky weather or the fact that spring seemed to take forever to get here, all I know is that everywhere I looked, the flowers were blooming. The tree in my own front yard brought a smile to my face every time I returned home. Life inspires art and as I sat down to create new work, the apple blossoms collection began. Using an actual twig from my tree, assorted hand carved and purchased stamps, I “drew” my clay pictures taking inspiration from shapes of my molds. Once the clay was bone dry, I used my watercolor underglazes to add color to the images before loading them into the bisque kiln. 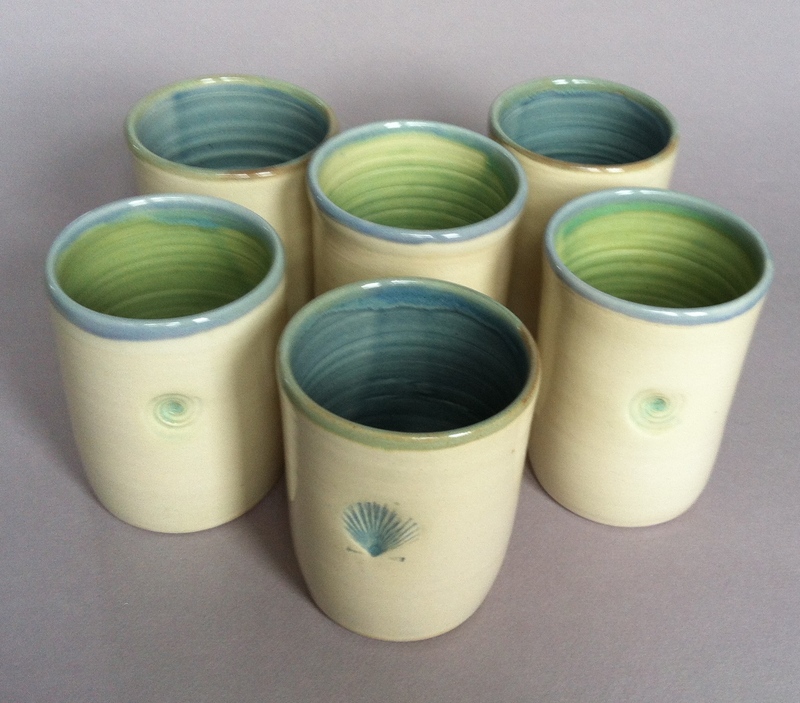 Out of the first kiln, the collection was glazed and loaded into the 2nd kiln to add functionality to each piece. At each stage, the flowers welcomed me and provided a memory that symbolized spring, rebirth, change, peace, beauty and more. My new collection is currently installed at the Dedham Square Artist Guild. 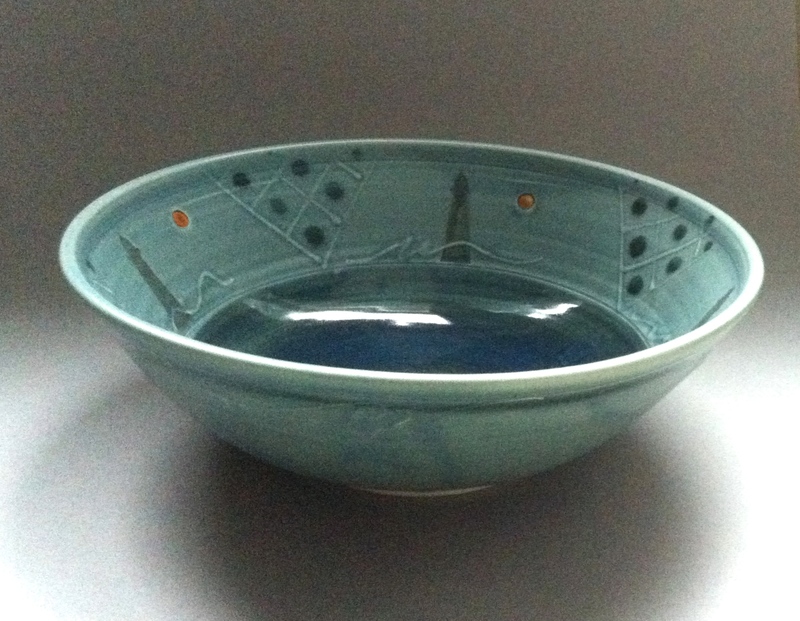 The work has a wonderful feel and quiet beauty that although functional, stands alone as ceramic art. 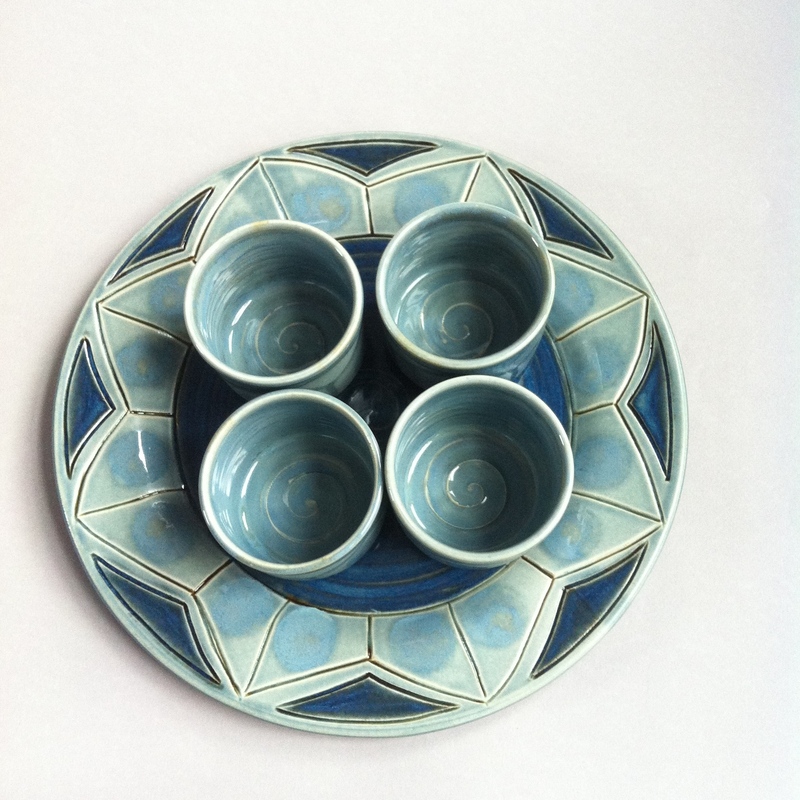 There are 6 pieces in this group … 2 small square plates, 2 small oblong trays and 2 larger square plates. 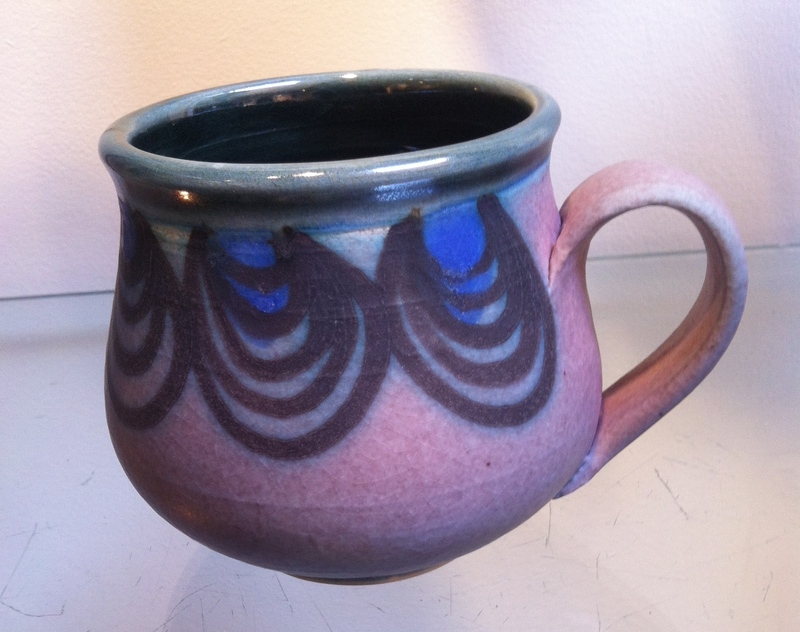 The Guild is open Wednesday – Saturday 12-6, Sunday 11-2 in Dedham Square. For the month of April, I will be Artist of the Month at the Dedham Square Artist Guild Gallery alongside Gillian Jackson Photography. We have both been guild members since our cooperative gallery opened over three and a half years ago. A benefit of membership is being artist of the month where your work is featured at the front of the shop in a larger area. 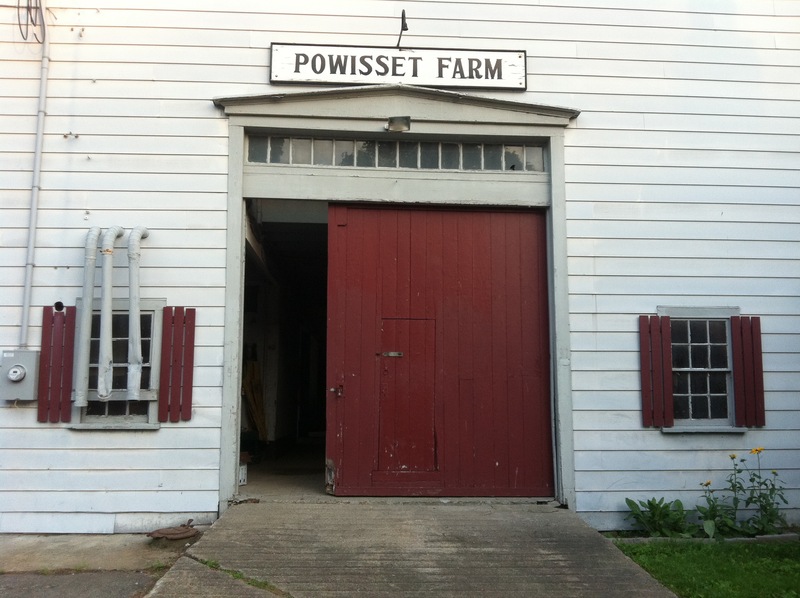 We will host a reception on Saturday, April 11th from 5-7pm. Please join us! From the dark days of winter, spring has finally arrived; the surfaces of my pots are rejoicing! Brush strokes filled with glaze dance across the surface in a repetitive manner evoking playful order. Blue buds of color join planes of glossy blue to celebrate both land and sea. 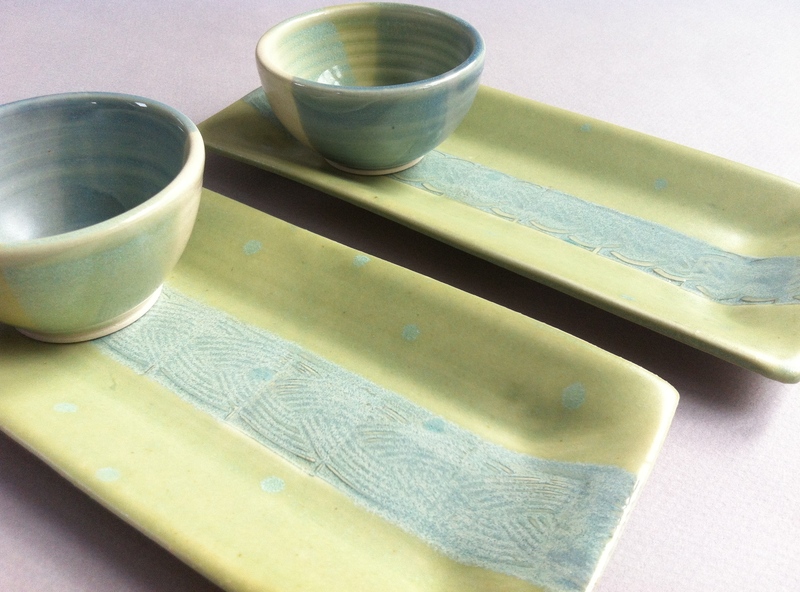 My spring collection is functional stoneware, easily used and beautifully versatile as it can exist on a dresser top or a table top or hung on a wall. The work I create is meant to be felt in your hand, seen by your eye and used in a way that becomes personal to you. To capture this group of photographs I walked and drove around Boston and its neighborhoods with a 400mm lens, and looked where I would not normally look, and took images in places that I would not normally consider; a liquor store parking lot, a view of Zakim Bridge through the streets of East Boston or a gargoyle or chimney hidden up in the roofline. There are also several skyline views to satisfy my traditional bent! 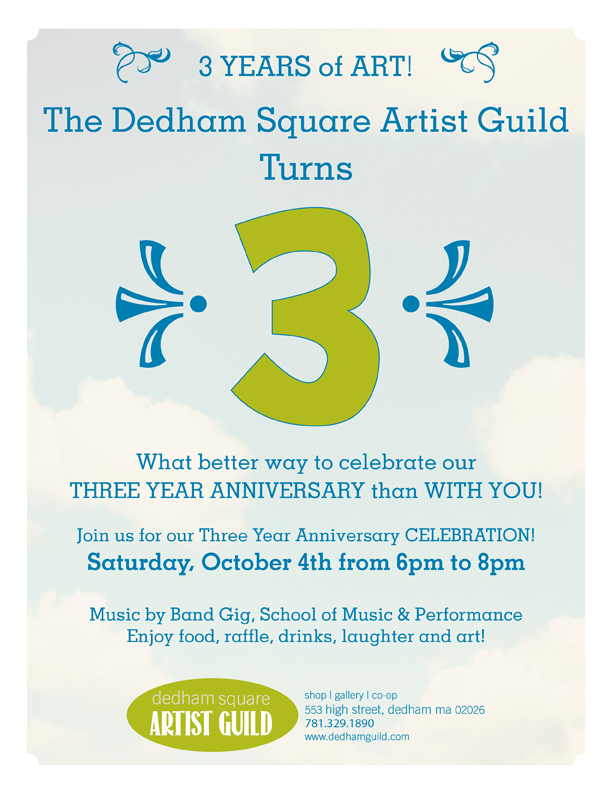 My guild in Dedham will celebrate it’s third birthday tonight, Saturday, October 4th from 6-8pm. There will be music, food and drink, and a great raffle filled with art. It is the perfect time to visit the guild to meet and purchase directly from the 23 guild member artists. I am the featured artist of the month at the guild. My “By the Ocean” collection will be featured up front for the party. You can find photos of this collection by visiting my flickr account but I recommend visiting the guild, located at 553 High Street in Dedham, MA to see my work, feel the texture and weight and enjoy the colors of this low fire collection. We poked our heads into many galleries, asking about artists and their work. 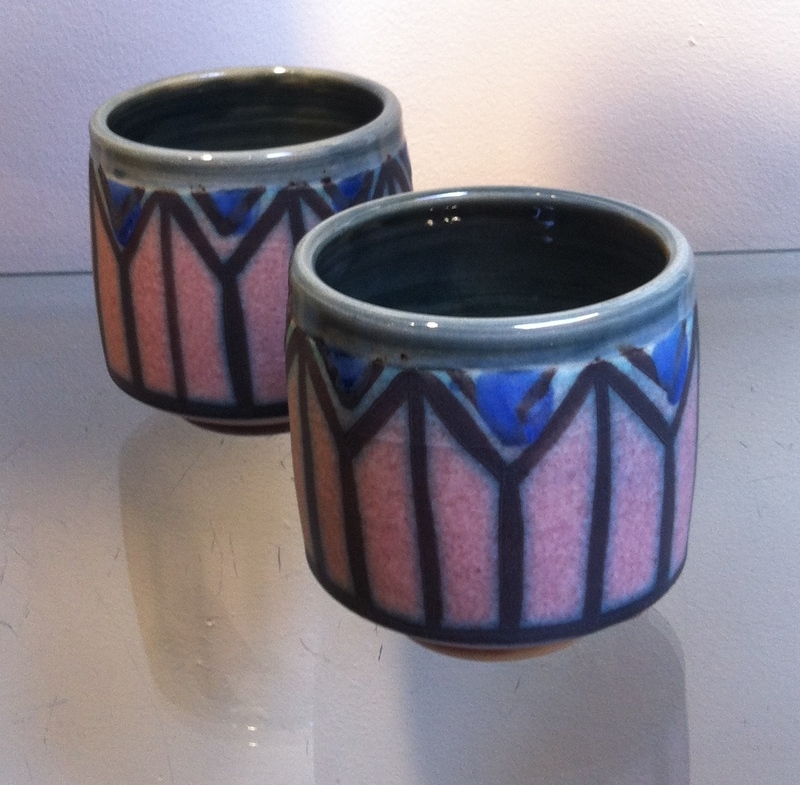 This mug and cup – above and below – really interested me and had the exterior not been rough, I would have purchased them. Instead I decided that they would define my trip and I began to work on my collection. 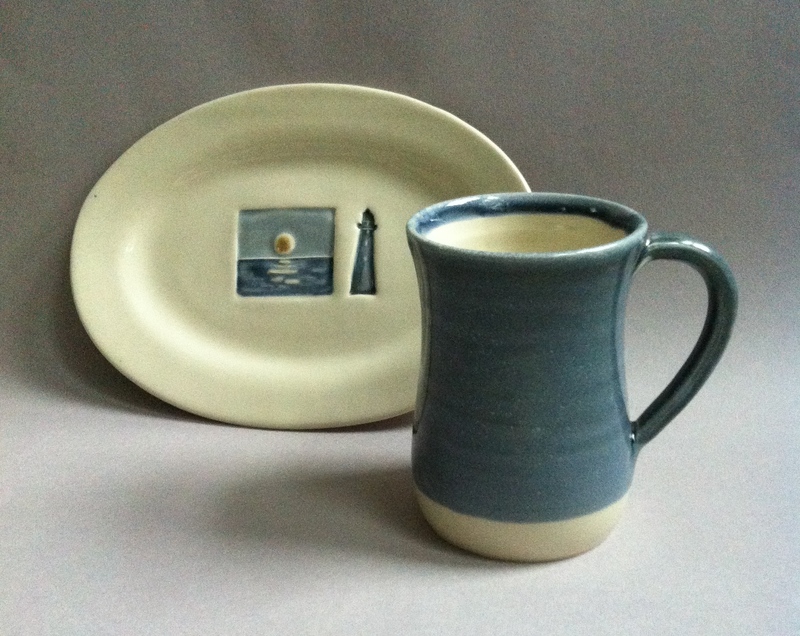 Pieces in the Portsmouth Collection are glazed in colors of New England by the water in wintertime. There are four small cups for tasting craft beer poured from a hand carved pitcher. The tasting cups fit nicely on a hand carved platter. 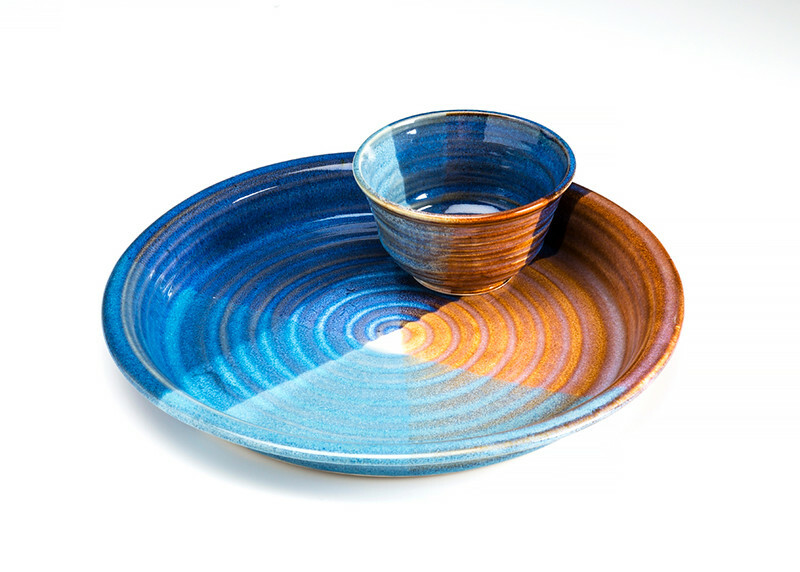 The platter makes it easy to pass the drink to your guests. 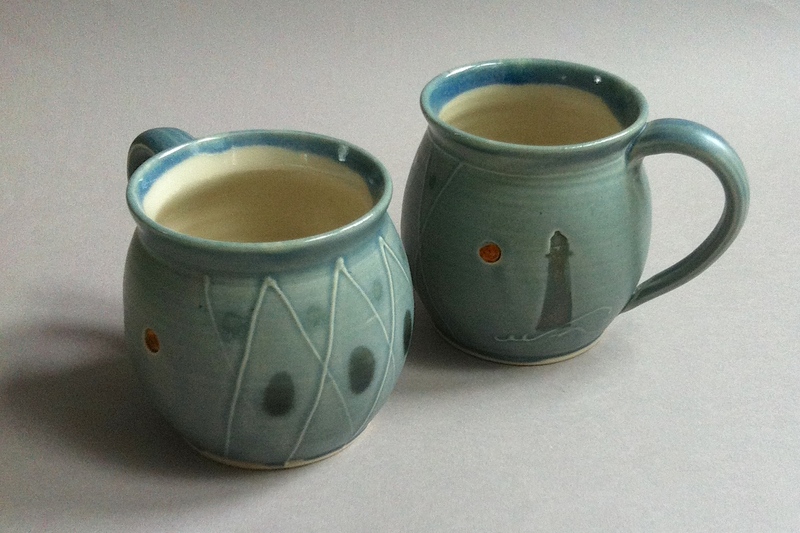 Wheel thrown mugs are embellished with stamps, slip trailing, and then dotted and painted with glazes. 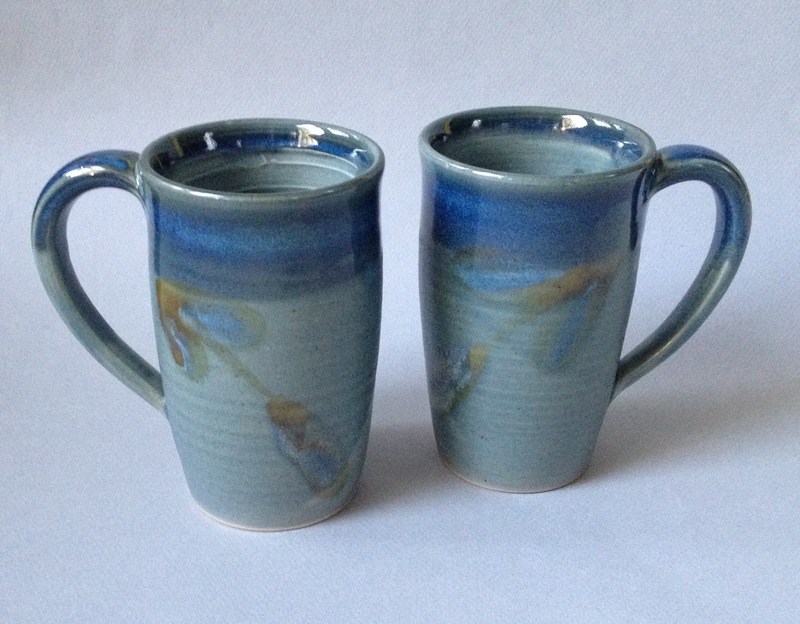 Each mug holds 14 oz of a beverage to warm you up on a blustery day. 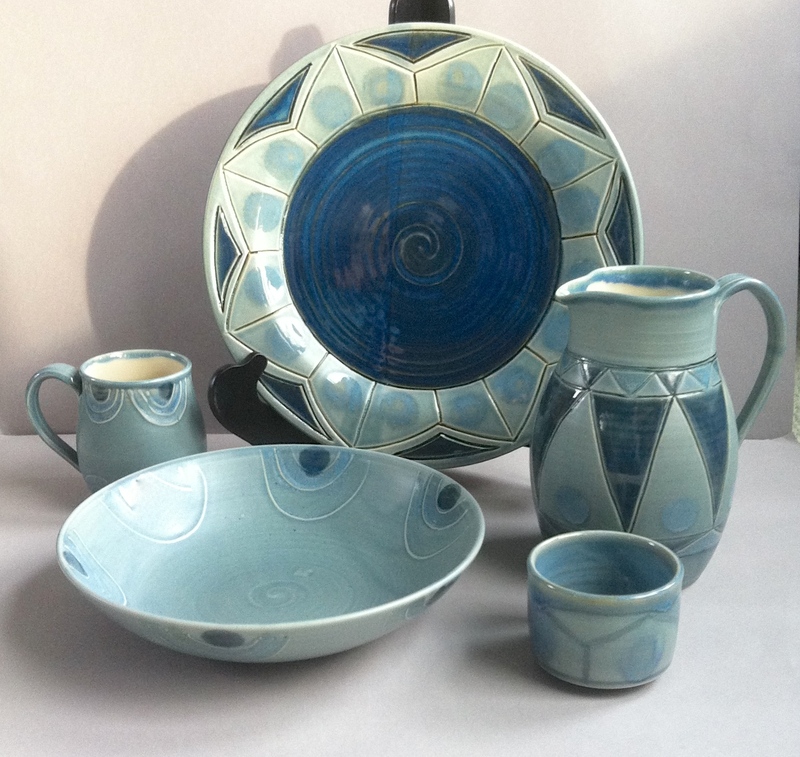 Mixing and matching pottery from this collection will make a versatile gift for any home or couple celebrating a marrage. Tasting cups stack nicely. 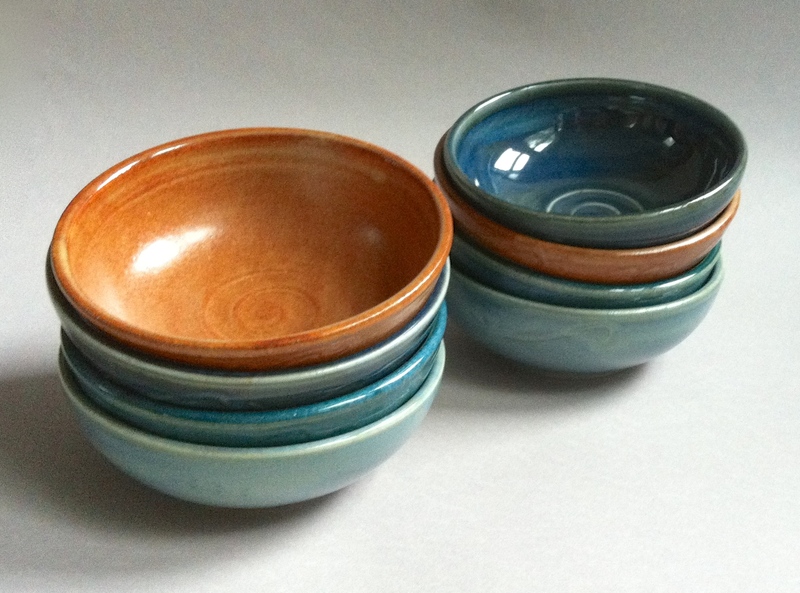 Pottery is dishwasher and microwave safe. 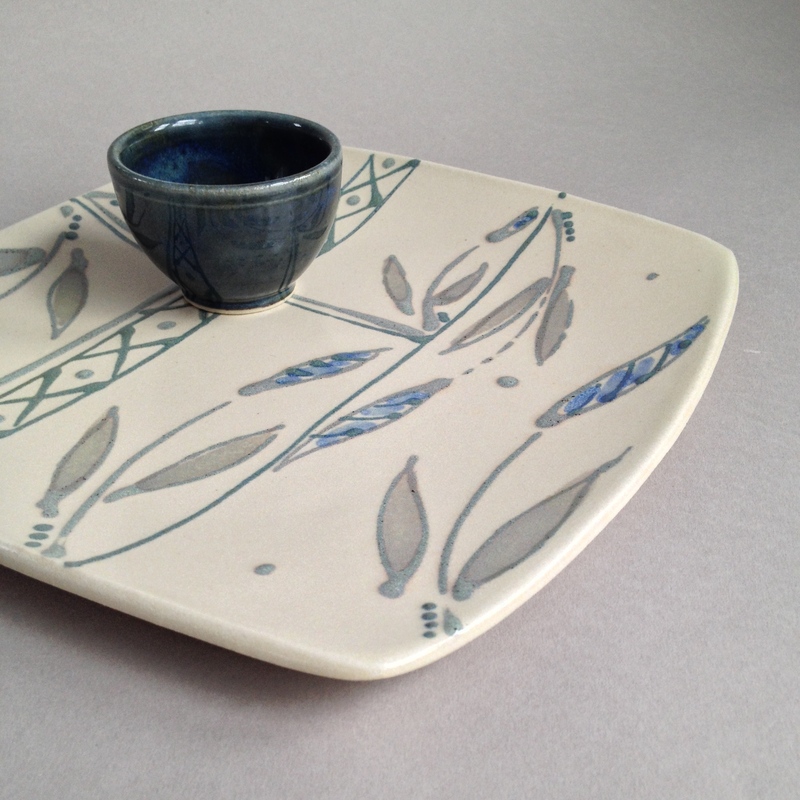 This work will make it’s debut at Potters Place Spring Show and Sale on May 2-4. 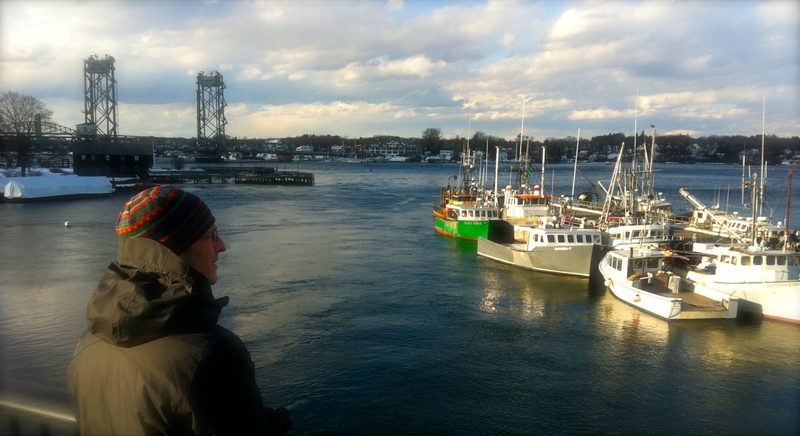 As a member of the Dedham Square Artist Guild, I gallery sit 6 hours each month. Wednesday, March 26th is my day at the Gallery and I can’t wait! It is a wonderful experience to be in the gallery – my guild! I love to see what members have recently added to their inventory and I look forward to seeing customers. I will be bringing in pieces from my Spring 2014 collection. This collection was influenced by a family trip to Turks & Caicos. Soft ocean blues and tropical greens work well with peachy tones from the sand. 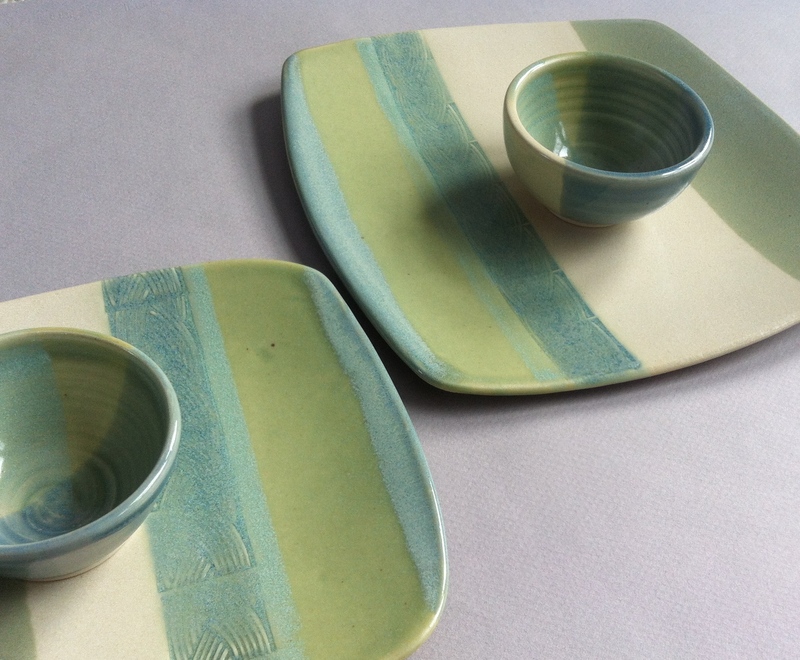 Shell imprints, basket weaves, patterns from the trip embellish the surfaces of plates, dishes, tumblers and bowls. Mix and match within this collection to create a wedding or birthday gift. Don’t forget Mom this Mother’s Day (May 11th). Pick up a piece for your Easter gathering and leave it for the hostess. Stop in to say hello today and support our local guild and member artists. Mark your calendars for Thursday’s opening of Wonderland across the street at the Dedham Community Theater from 6-8PM. 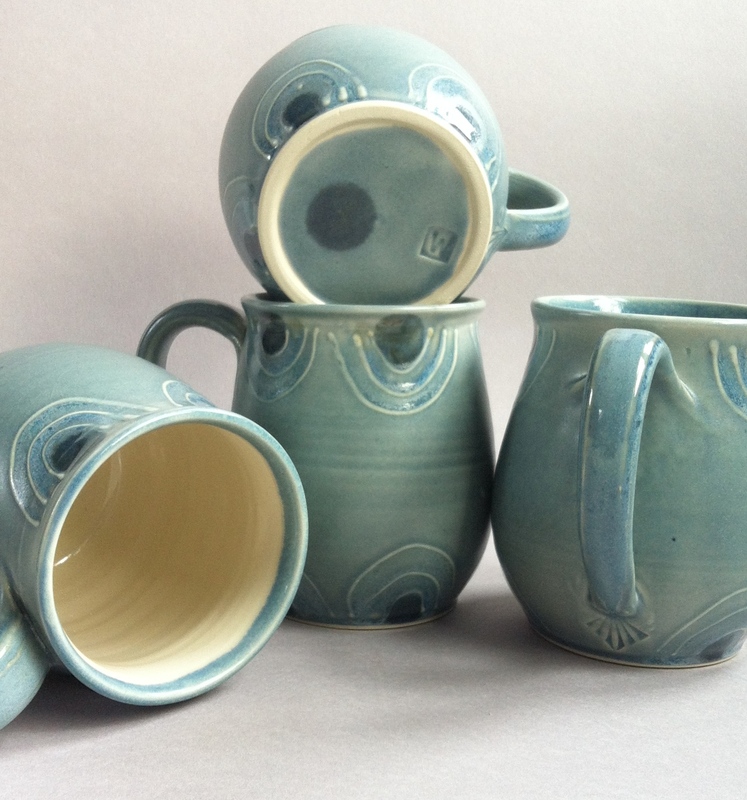 New Pottery is ready to go out to local galleries and be featured at events this fall season! 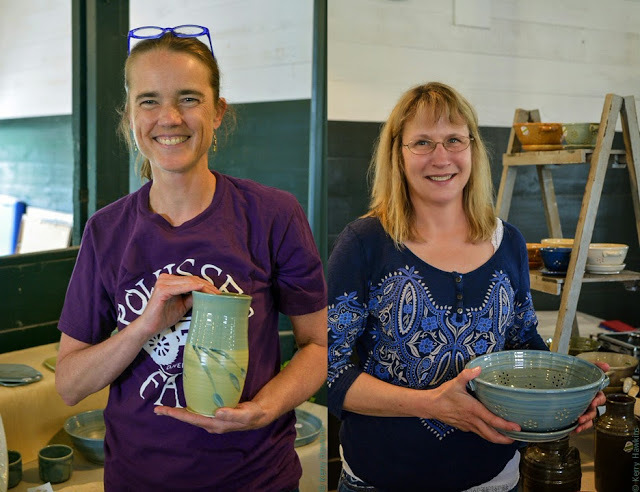 The Dedham Square Artist Guild and the Dedham Community House have a partnership to get to know the artists through classes and workshops. 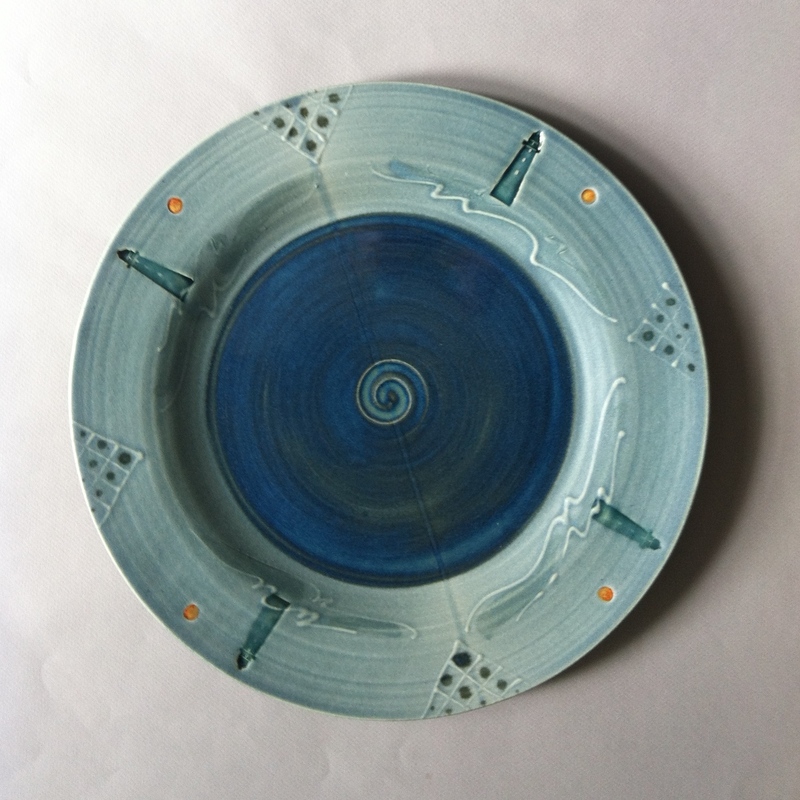 AND thank you to Dave Bradley for the beautiful photograph of my plates! 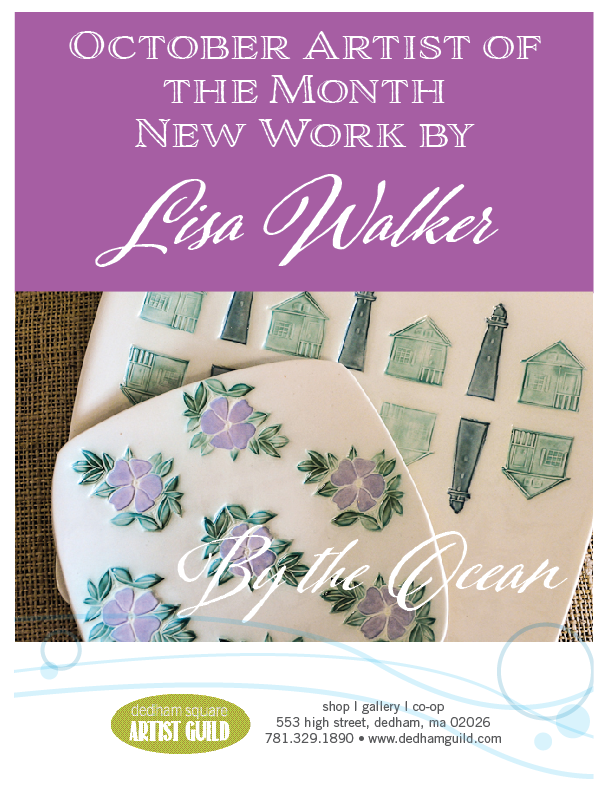 Any updates or additional information can be found on my website http://www.lisawbwalker.com as well as listed on the sidebar of this blog.